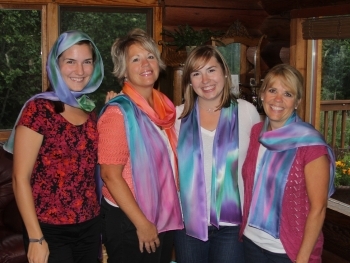 Come paint at our log cabin home in Chugiak where we invented Paint a Scarf. 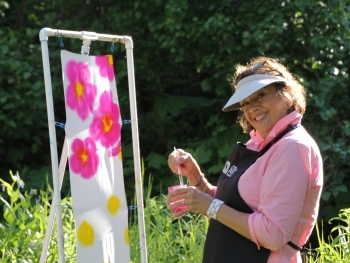 On nice days we paint outside by a rushing creek. On chilly days we paint indoors. Snacks, coffee and tea service included. Choose from designs and dozens of colors. Two sessions daily Wednesday-Saturday in the summer. Other times by appointment for groups of 4 or more. Reservations required. Paint a Scarf Pub brings scarf painting to a restaurant near you. Choose from our four most popular designs. Train and paint in less than an hour. 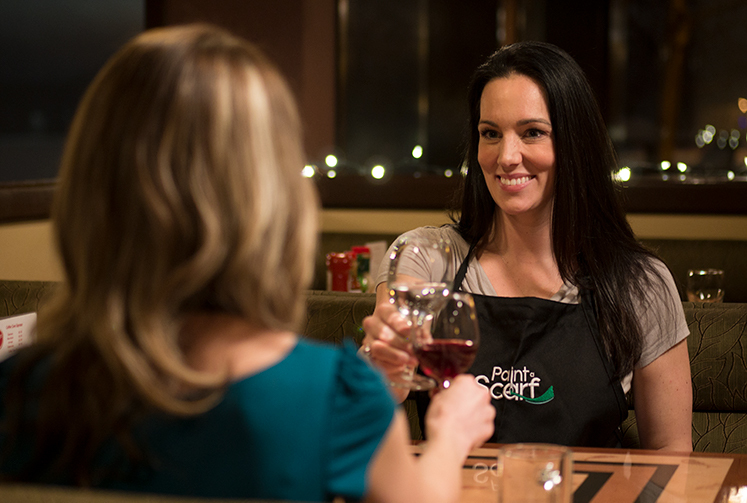 While your scarf dries enjoy a satisfying meal or share a drink with friends (at your own expense). Go home with a full tummy and beautiful scarf you painted yourself. For more details check out our PUB page and watch our PUB video by clicking here. We offer Premium parties at our cabin for groups of four or more. Come paint by a warming fire and enjoy the complete Premium experience. Or we can bring painting to your gathering of 10 or more. We also do fundraising events for nonprofits. For details and prices check our party page by clicking here.